Sometimes we just need to escape from our everyday life to a different world, where the beauty and the calm energy of nature and its surroundings awaken all our senses and intuition. These three heavenly retreats will take you to paradise, where everything is magical, vibrant, and nurturing to the mind, body, and soul. Nature, yoga and the healing arts are intertwined in each of these places. Return home rejuvenated and inspired, with new appreciation toward love, and a profound understanding of the interconnectedness between humanity and nature. Get into the slow pace of life at Desa Seni, an eco-friendly resort located in Canggu, a seaside village twenty minutes away by car from the trendy Seminyak area that feels like a world away, with black sand beach, great surfs, lush rice fields, hidden villas, and not much else. At Desa Seni, whose name means “Art Village” in Bahasa, you’ll find a diverse collection of authentic antique furniture and decorative arts curated from the rich archipelago. Stay in traditional wooden homes named after different Hindu Gods. These charming, unique homes were refurbished and imported from different parts of Indonesia. Desa Seni offers a variety of vacation packages and holistic wellness programs designed to help you find your balance again. Join the daily yoga classes at the beautiful yoga shala set amidst the lush garden, get pampered with a Balinese massage at the spa, participate in a detox program, or just relax by the salt water pool and have an organic vegetarian snack from the garden restaurant. Life is paradise here! Located in the spectacular wilderness of Cortes Island, the 44-acre Hollyhock is a heart opening, full sensory experience. Everywhere you look, there are stunning views, from the fairy tale gardens and rambling forest to the ocean and the beach. Open from March to November, Hollyhock offers programs such as yoga, wellness, leadership, meditation, writing, and cooking. Memorable moments include kayaking at sunset to catch the sparkling bioluminescence and sailing to nearby islands. A must do is getting a bodywork treatment - Hollyhock is known for its exceptional body workers. The healthy, organic vegetarian fare is prepared with herbs, greens, and vegetables harvested daily from the Hollyhock garden. Everything is done with love, and you can feel the vibrant energy from the food, the people, and the surrounding nature going into your body. At Hollyhock, it’s so easy to just chill and relax. If your vision of paradise involves the ocean and the jungle as well as a volcano, lots of kirtan chanting, ecstatic dance, and hula, Kalani is the place for you. Located in a tropical jungle overlooking the Pacific Ocean in the Puna district on the Big Island of Hawaii near volcano Kilauea, Kalani, true to its name, is “heaven on earth” on 120 acres. 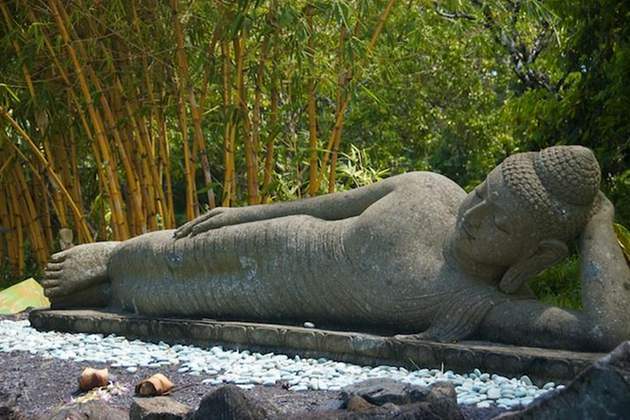 Healers flock to this part of the Big Island for the intense, healing energies provided by the surrounding nature. Stroll the black-sand beach, hike by waterfalls, float up in bliss during a Watsu treatment, or simply just be and smell the orchids. Simple and comfortable accommodations range from cottages and lofts to bungalows and rooms. The Kalani Experience, available year round, includes accommodation, daily meals, and yoga classes for seven days/six nights, as well as bodywork, a half-day adventure, and wellness and cultural classes.